Heat a medium saucepan with the olive oil. Add the tomato paste and cook on medium heat for a minute or two. I bought some Turkish tomato paste from Istanbul. 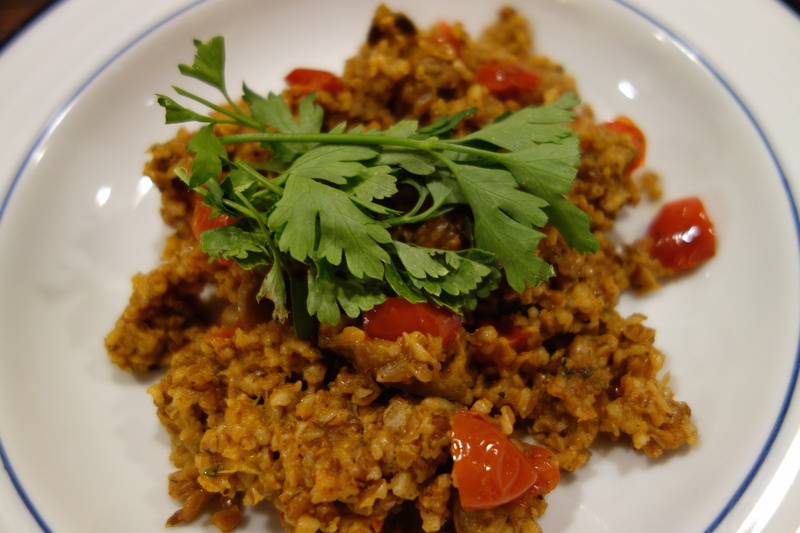 I got the spicy kind, which has chilies in it- but regular tomato paste can be substituted. 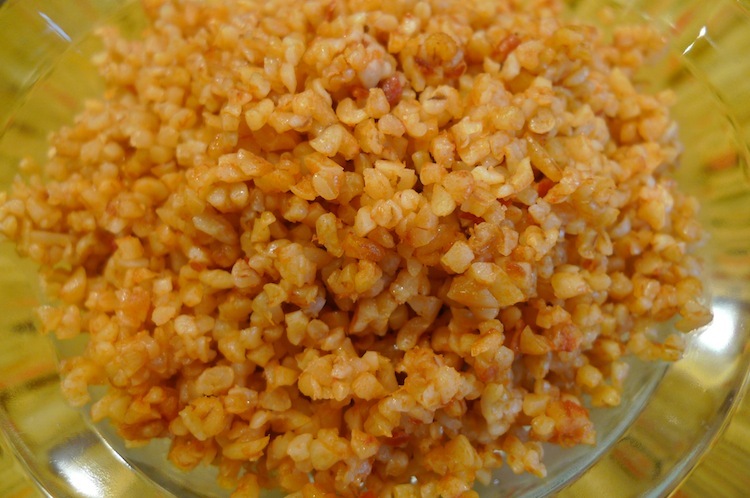 Add the bulgur and stir. Add the broth and salt and bring to a boil. Lower the heat, cover and let cook for 10 minutes. Turn heat off, fluff with fork and let sit for another 5 minutes. Check for seasonings and serve. Soak the breadcrumbs in the milk for about 10 minutes and keep aside. Transfer the soaked breadcrumbs, ground meat, salt, cumin, all spice, sumac, dried mint, garlic, egg and parsley to a large food processor. Process till a smooth mixture is achieved. Take out and let the mixture marinate for at least 2 to 3 hours. 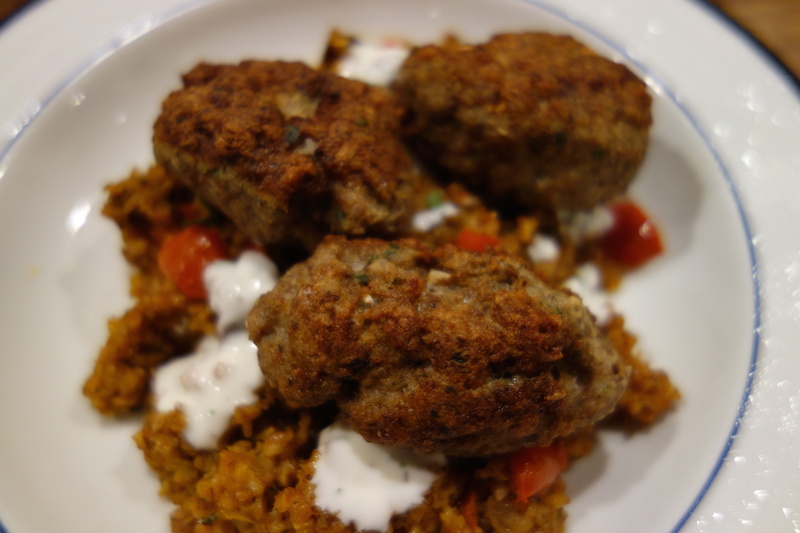 Form into meatballs or kebabs, about ¼ cup of mixture for each kebab. Heat a frying pan with the oil and cook the kebabs on a medium heat, turning every 2 to 3 minutes until all sides are brown. Cook till the kebabs are cooked through- about 10 to 15 minutes. Serve with yogurt sauce. Mix all the ingredients including the yogurt in a bowl. Serve with the kebabs. Yummy lentil soup for meatless Monday!! Heat a medium saucepan with the oil. Add the onion, ground cumin and mint. Saute on medium heat, stirring constantly for 5 minutes. Add the lentils, potatoes and broth. Bring to a boil and add the salt and turmeric and simmer on medium heat for 15 to 20 minutes adding more broth if necessary. Once the potato chunks are soft, take off the heat and let cool. Transfer to blender and blend till smooth. Pour the liquid back to the saucepan and bring to a boil. 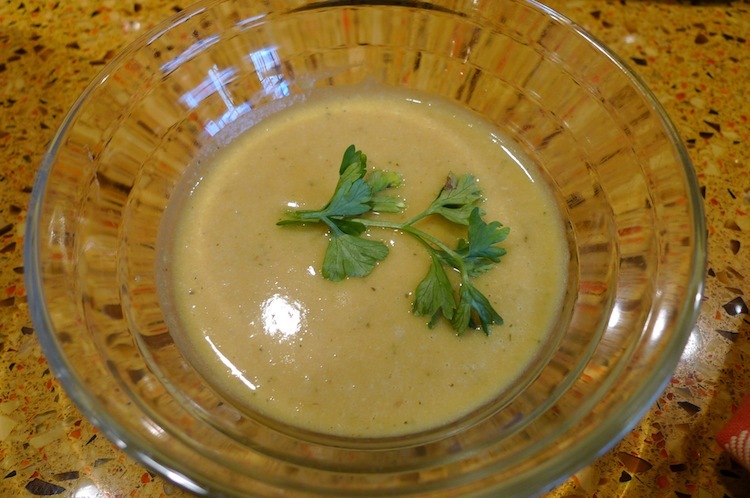 Adjust the consistency by either adding more broth or cooking off extra broth. Check for seasonings. Squirt some fresh lemon juice right before serving. Transfer all the ingredients to a mixing bowl, mix well and let sit for 2 to 3 hours. Form about 12 sausage shaped kebabs and then insert a skewer through each and grill till done. 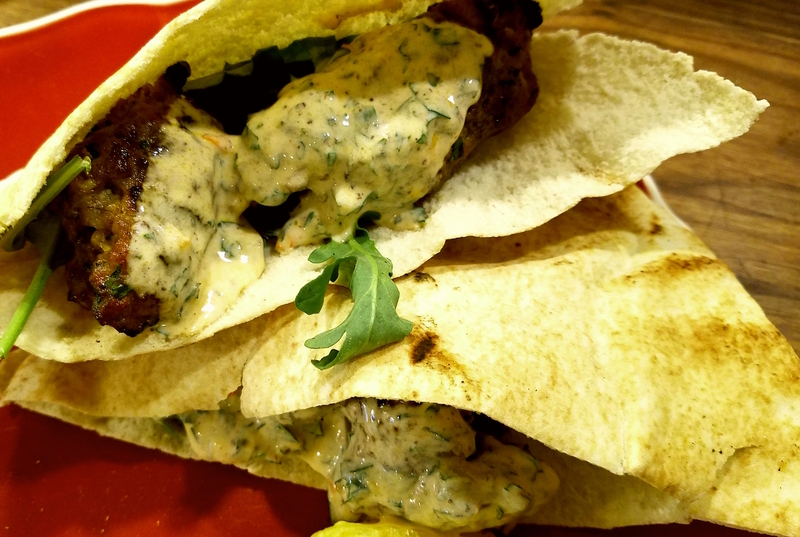 Serve in warm pita with some greens like arugula topped with the harissa sauce. 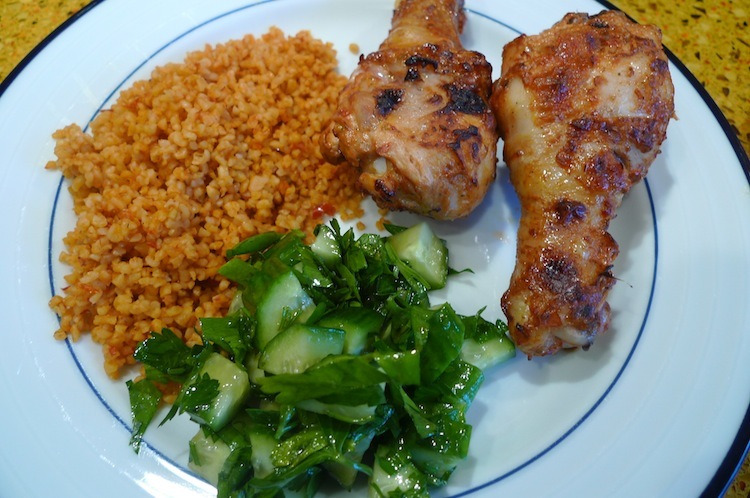 Mix everything in a small bowl, taste for seasonings and serve over the kebabs. We ate loads of kebabs during our visit to Turkey and surprisingly I didn’t get tired of them.. they were delicious. We have lots of kebabs in the North of India as well but the difference is that ours have ginger and garlic, where as the Turkish variety don’t. For these kebabs I did some research on Turkish kebabs and came up with a variety of ingredients. I used the pomegranate molasses as well as the tomato paste I bought from Istanbul. The kebabs came out very well.. do try them.. Mix all the ingredients in a medium bowl. Transfer chicken pieces to a ziplock bag and add the marinade. Massage the bag to ensure all pieces are coated with the marinade. Marinate in the fridge over night or at least 2 to 3 hours. Take out of bag and place on to a lined cookie sheet. Grill outside or in the oven. 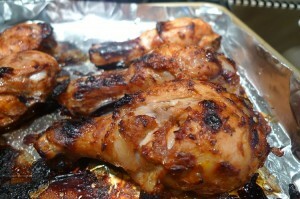 If cooking in oven, broil to brown evenly and then cook in a 350 degrees F oven till the chicken is done. Sprinkle extra salt if needed. Drizzle fresh lemon juice. Serve immediately! 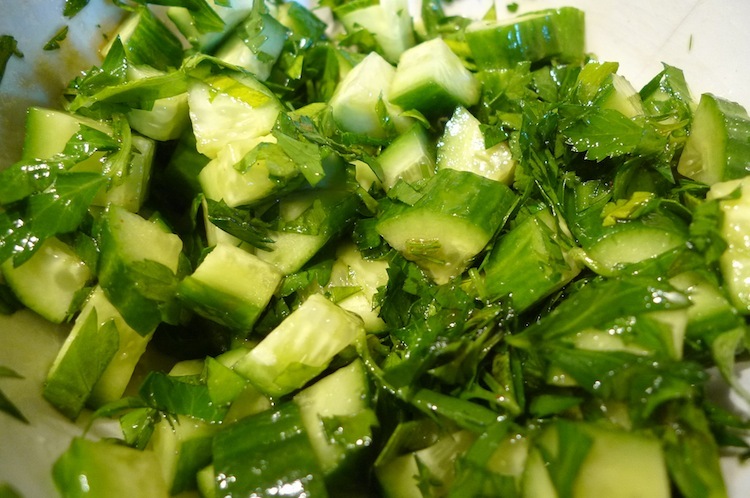 Transfer the parsley, cucumbers and green onions to a medium bowl. Add the salt, pomegranate molasses and olive oil. Mix well and serve!